Queen duvet cover (88" x 88") featuring the image "Durango-silverton Twin Bridges" by Inge Johnsson. Our soft microfiber duvet covers are hand sewn and include a hidden zipper for easy washing and assembly. Your selected image is printed on the top surface with a soft white surface underneath. All duvet covers are machine washable with cold water and a mild detergent. Congratulations on your feature in the Spirit of the West group! Congratulations! Your incredible image is featured in the Spirit of the West Photographs only group! What a great image Inge! Congratulations on your sale. I agree with Robert Bales... Best of the day! Fantastic photo Inge! I have been two times in Durango and Silverton but I never took the train, maybe next time!! Great image of a great piece of history Inge! Thank you very much, Marcus! 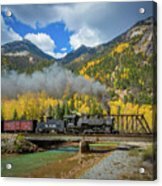 The Durango and Silverton Narrow Gauge Railroad (D&SNG) is a narrow gauge heritage railroad that operates 45 miles of 3 ft track between Durango and Silverton, in the US state of Colorado. The railway is a federally designated National Historic Landmark and is also designated by the American Society of Civil Engineers as a Historic Civil Engineering Landmark. 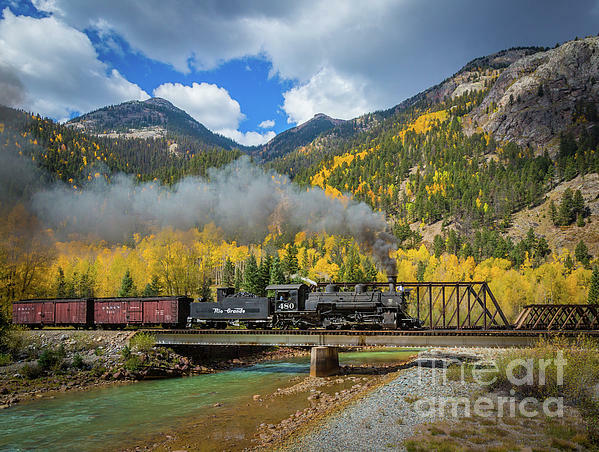 The route was originally built between 1881 and 1882, by the Denver and Rio Grande Railway, in order to carry supplies and people to and silver and gold ore from mines in the San Juan Mountains. The line was an extension of the D&RG narrow gauge from Antonito, Colorado to Durango. The last train to operate into Durango from the east was on December 6, 1968. The States of New Mexico and Colorado purchased 64 miles of the line between Antonito and Chama, New Mexico in 1970 and operates today as the Cumbres and Toltec Scenic Railroad. The trackage between Chama and Durango was abandoned and rails were removed by 1971.